Justin Timberlake Archive - Meet May's #TNKidOfTheMonth : Taylor! You are here: Home / News / Meet May's #TNKidOfTheMonth : Taylor! Meet May's #TNKidOfTheMonth : Taylor! Photo: #TNKidOfTheMonth Taylor with DJ Freestyle Steve before The 20/20 Experience Show in Nashville! TN Kids! 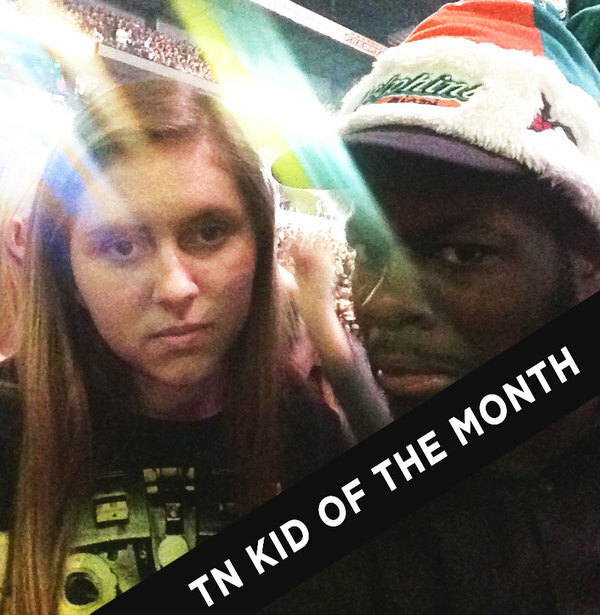 We had another great round of submissions for #TNKidOfTheMonth! We're so lucky to have such a dedicated, creative, and welcoming fan base. In the past two weeks alone, we've found one portrait of Justin made entirely from rubik's cubes and another made from thread and nails! Seriously, y'all are the BEST. It just keeps getting harder to pick only ONE #TNKidOfTheMonth. You might remember her from the video she organized during The 20/20 Experience World Tour. She asked TN Kids from all over the world to send in messages for Justin himself. So impressive, Taylor. Watch it below - you might even see yourself! What does being a TN Kid mean to you? How long have you been part of the family? It means so much more than just loving Justin's music. Being a TN Kid means supporting Justin in whatever he does (music, acting, or any of the other areas he explores!) And of course, it means being a part of the TN Kid family - #TNKidFam! Have you met any other TN Kids along the way? I've only met a few other TN Kids in person at concerts. My closest TN Kid friends are on Twitter! My favorite moment from The 20/20 Experience World Tour is from the concert I went to in Nashville (2014). I met DJ Freestyle Steve before the show, and he could tell I'm a huge fan! About an hour and a half into the concert, right when the bridge was about to move, Steve came by and brought me to the VIP section! I was so excited! Then Steve took some fans and I to a specific spot and told us that Justin would come by and sing to us. He was right! Before I knew it, "Human Nature" started playing and Justin Timberlake was walking right toward me. Justin even waved at me! That was by FAR my favorite moment on the tour. Thank you! Thank you for putting a smile on my face every single day, making me laugh, and being my role model. Please never stop doing what you do! JT song: "Losing My Way"
JT dance: "Like I Love You"
Congrats Taylor! And I love the video! Wish I could have been in it but that's okay. You did a great job! Congrats to you Taylor!!! You're such a sweetheart and I'm so glad you got chosen! !